Owning a shredding machine is necessary for all companies. Often times, people working in both large and small companies have to deal with a lot of papers some of which may be confidential. In order to ensure proper care is taken when handling these sort of papers, they should either be kept under lock and key, or completely destroyed. Confidential documents that have been under lock and key for several years could become less important to a person or company. However, that doesn’t stop the impending disaster that may ensue, if and when it falls into the wrong hands. It’s possible you destroy such documents by tearing them into tiny pieces with your bare hands or with the aide of scissors; but have you thought of how much valuable office time you’ll be wasting each time you do that? With a shredding machine, all you need do is feed the paper and continue with your office duty. The machine does the remainder of the job. Shredding machines come with a lot of features that make them fun and easy to use. There are three major types which are the microcut, crosscut, and strip cut. We’ll be reviewing three of the best cross-cut paper shredders in the market today so take your time and choose your most preferred. You might also follow-up with our individual cross-cut shredder reviews. The Aurora AU1400XA Jam Free Cross-cut paper shredder happens to be among the elite shredders in the industry today. Capable of shredding 14 sheet of papers at once, you have a machine that can handle medium and large sized tasks effortlessly and efficiently. There are a host of features that needs to be reviewed before purchasing machines as this in any office and some of these features will be discussed in detail below. The first feature which happens to be a very vital one for shredding machines is jam free operation. Shredders that don’t have this feature will keep causing you extra problem as you’ll need to spend vital time attending to paper jams. The AU1400XA crosscut shredder is designed with a jam free technology which will in the long run prevent frequent repairs and increase its lifespan. In as much as every company wants to keep their running cost as low as possible, Aurora’s AU1400XA crosscut shredder instantly complements that. Machines fitted with electric motors are known to consume more energy thereby impacting negatively on electricity bills. With that in mind, Aurora’s AU1400XA is designed to idle out when not in use within five minutes so that your bills remain within ideal budget. If your office is a busy one and the shredder located centrally so that everyone gains access to it, you’ll need a very powerful machine. One that not only shreds a bunch of papers at once, but also has a bin capable of containing a lot of shredded documents. The AU1400XA has a 5.0 gallon capacity waste bin which is just enough for you; it also has the ability to shred 14 papers at a go. 5.0 gallon capacity is capable of collecting about 200 sheets of shredded paper and since 14 can be fed at once, it invariably means that about 14 persons will have to shred 14 sheets of paper each before the bin is full. In order to elongate the life of this powerful machine and also form a safety protection for users, it is designed with an advanced safety feature which instantly powers off the shredder as soon as it senses any forced entry. Just as earlier stated, this machine is designed for heavy duty shredding operations and that is proven with its 10 minutes non-stop continuous runtime. Its 45 minutes off cycle is also sufficient for most working places. Machines as these should have a way of communicating with their operator especially when the information to be passed is vital. Overheating for example, is a vital information that an operator should know about. The bright led indicators situated on the machine does the communication job perfectly. Multifunctional shredders are widely preferred in companies because of the variety of items that may require shredding. Although papers form the bulk of items that are shredded using shredding machines, credit cards and compact discs may also contain confidential information. The AU1400XA shreds papers, CDs, DVDs, credit cards, paper clips, and staples, making it one of the most universal and best cross cut shredders. Finally, its quiet operation is the icing on the cake. Shredders unlike other heavy duty equipment are placed in offices and as such needs to operate silently. With Aurora’s AU1400XA in your office, you can be sure that no one would be distracted while in operation therefore, they can continue with their businesses as much as you also can. 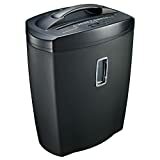 If you are still in search for the best crosscut shredder in the market then you have probably not looked at the AmazonBasics 6-sheet Cross-cut paper shredder before. It is a lightweight machine that promises the best shredding experience you can every find. It provides you with the means of destroying confidential documents including papers, CDs, DVDs, credit cards, and more. It is also designed with an auto start/shut-off, and manual reverse mechanisms to make shredding operations as hassle free as possible. The auto start mechanism senses the presence of papers or other items that needs to be shredded and automatically starts the machine. As soon as the operation is over, the auto shut-off mechanism turns off the machine thereby helping you conserve energy. Another function of the auto shut-off feature is to sense the presence of an un-shreddable object and act immediately to turn the machine off. The same auto shut-off feature is programmed to shut the machine off when it senses that the machine has been running for some time and the motor is beginning to overheat. AmazonBasics crosscut shredder employs two blades which it uses to cut papers into rectangular shapes. Shredded pieces take the dimension of 7/32 X 1-27/32 inches unlike strip-cut shredders that slices documents into longer strips. Although micro-cut shredders are more secure than their cross-cut counterparts, the latter is quite faster and also, to a large extent, secure. When you have the need to purchase a machine for your office, you’ll always prefer a stylish design so that it does complement the beauty of your office, rather than the opposite. The AmazonBasics 6-sheet crosscut shredder is beautiful in all ramifications; it is also designed to fit into all offices. In terms of performance, the machine is fitted with series of LED indicators which signifies various working conditions. You have the warning lights which warns against overload, overheat, and wrong alignment. You also have the status lights which indicates that the machine is Ready, or Disabled. The bin has a capacity of 3.8 gallon which complements the 6-sheet feed capacity. There is a little opening close to the top of the machine so that you can see the shreds as soon as they get to the top of the bin; you’ll therefore know that the bin is full and needs to be emptied. Since the machine is a lightweight design, it can run continuously for only two minutes after which it’ll require about 30 minutes to cool down before you can use it again. It is best used for light shredding operations in offices that are not too busy. Documents such as credit cards, CDs, and DVDs, needs to be fed one at a time into the separate space provided for shredding but notwithstanding, the final result is impeccable. Mechanical machines need frequent maintenance in order to last long and the AmazonBasics crosscut shredder is no different. However, maintenance required for it is not as hectic as those of other machines. All you need is to lubricate the moving parts of the machine once in a while to ensure that it continues working at optimum efficiency. Everyone wants some form of warranty on products like this and AmazonBasics understands that. They therefore provide you with a 1-year limited warranty giving you that rest of mind you deserve. Shredders are preferred in most organizations due to the time it saves by destroying important documents in such a way that it cannot be reassembled. This generally stops unauthorized persons from gaining access to confidential documents. The Bonsai DocShred Cross-cut paper shredder is one of the preferred shredders in the market today due to its high efficiency and ability to prevent crimes such as fraud, identity theft, and all forms of similar crimes. Its flexibility is another feature that makes it immediately stand out from others as you can use it not only in your office, but at home too. The C156-D shredder is designed in such a way that makes its features easy to use. It is perfect for office use as it can shred a wide range of confidential documents such as forms, bills, credit cards, CDs, and DVDs. The ability to swallow up a bunch of paper sheets at once adds to the beauty of this machine. This means that you don’t need to feed your documents one after the other for shredding; rather, arrange up to 12 into a bunch and feed at once. The machine will comfortably take up the bunch and shred them in a few seconds. A second slot is made available for shredding media discs and credit cards but since these documents are somewhat tougher than papers, you are required to feed them one after the other through the slot into the machine for shredding. Machines that deal with papers have the ability to jam once in a while and this can be frustrating as you’ll have to leave whatever you are doing and attend to it. The Bonsaii shredder is designed with Jam and overload protection. The jam protection helps prevent paper jams while the overload protection helps protect the machine’s motor by switching off as soon as it senses any abnormal situation. Abnormal situations include feeding documents that exceeds the machine’s shred capacity, or prolonged shredding operation beyond the advised runtime. A reverse function switch is placed on the machine and its job is to help resume normal operation in the event that a paper gets stuck. Being a lightweight machine with dimensions: 17.7 x 8.6 x 13.8 inches and weight of 7.6 pounds, it can easily be moved from one office to the other, or even from your office to your home. The handle provided at the top of the machine makes it even easier. Still on design, the C156-D has a huge waste bin capable of storing a lot of shreds so you wouldn’t have to empty it every now and then. A little window is also placed at the top of the bin from where you can easily see how full the bin is. The ability of a shredding machine to run quietly is a feature everyone using it in an office wants. Bonsaii’s shredder doesn’t disappoint in this aspect as it works silently and efficiently. Paper shreds made by the machine generally take the dimensions of 5 x 45 mm which is small enough to frustrate anyone who wishes to reassemble. To cap off the amazing features of this wonderful machine, a 1-year limited warranty is placed on it. When it comes to selecting the best cross-cut paper shredder for your home or office, confusion may set in due to the fact that they all have similar features and amazing looks too. Well, the best choice should be one that is capable of handling the kind of tasks your office throws at it. 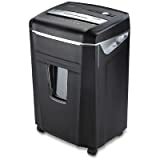 If your office is such that shredding operations are sparingly done and you are sure that there will be no heavy shredding task in the foreseeable future, then I’ll advice you to go for the AmazonBasics 6 sheet shredding machine. It has all the attributes of a best seller coupled with the fact that it is very affordable. In fact, it is often labeled as the best cheap cross-cut shredder for home use. If on the other hand your office is such that shredding operations are done every other day, you should look towards Aurora’s AU1400XA shredding machine. It’s sturdy and known to be a workhorse. Capable of shredding continuously for 10 minutes before requiring rest, it’ll definitely handle all shredding operations your company throws at it.